Eileen Melia and Toni Marshall, July 2007, in Chantilly, VA, at a Northern VA CFS/ME, FMS, & OI Support Group meeting. 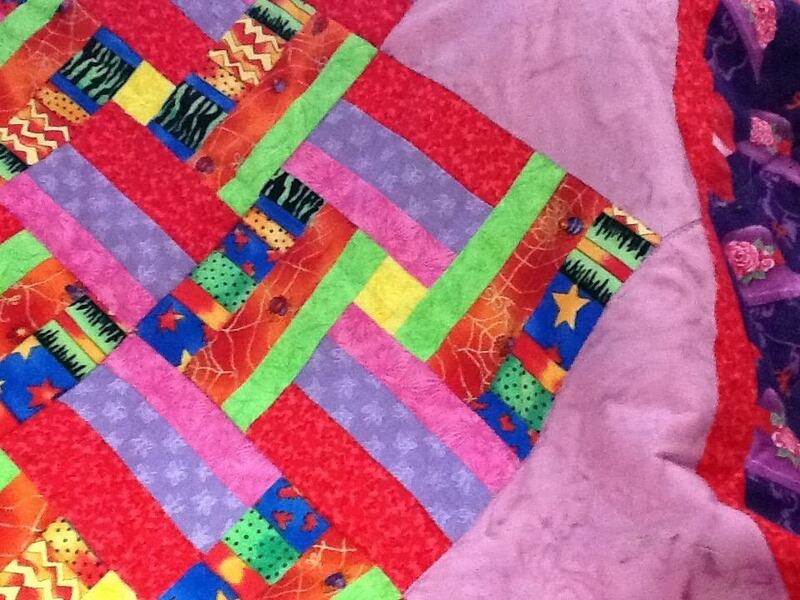 My friend Eileen Melia is unique quilter who pieces together material, meditations, and motherly outreach. Fabric selection, sewing, and writing appreciative, enthusiastic words and symbolism for the ultimate receivers are all part of her Affirmation Quilt Ministry. Through our occasional in-person encounters at our ME/CFS support group and a Writing Grace transformational class with Alissa Lukara, and via our conference calls and shared writing for practicing gratefulness in my gratitude group, Eileen, Toni and I reached new levels of comfort and understanding and acceptance. 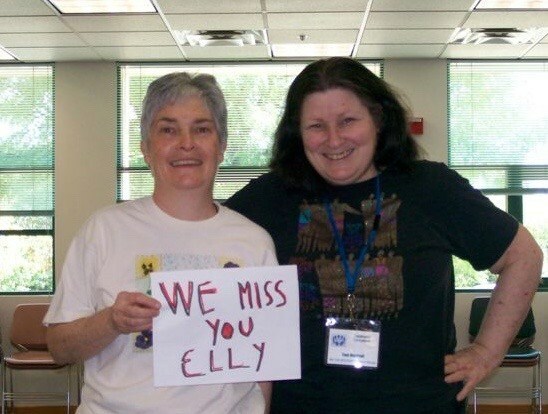 It deepened our friendships and gave Eileen more insight into the years of and ongoing support group volunteerism by Toni Marshall and me, Elly Brosius. We answered the calls others didn’t. Eileen’s quilts for Toni and me came in their own special timing, for Eileen to make them, and for us to receive them physically. finding Serendipitous Graces In The Garden of Life . 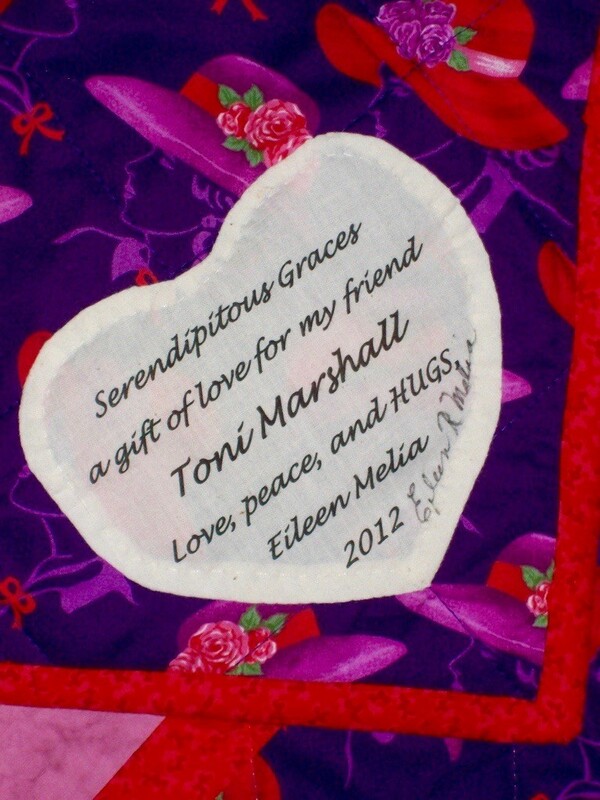 Toni’s Serendipitous Graces quilt came in June 2012, exactly seven years after we met Eileen for the first time face to face at a kNOw More CFS event our Northern VA CFS/ME, FMS, and OI Support Group co-sponsored with The CFIDS Association of America before they rebranded to be the Solve ME/CFS Initiative. The speakers were validating, expert, and provided excellent information on research and on the practical aspects of living more comfortably with orthostatic intolerance (OI), our preferred and most practical for treatment diagnosis. The speakers became two of Toni’s favorite professionals to quote, Cindy Bateman, MD, now of The Batemman Horne Center in Salt Lake City, UT, and Staci Stevens, MA, of the Workwell Foundation. I remember Toni staying up late at my house the night before that kNOw More CFS event practicing an introductory speech over and over. I knew I couldn’t handle public speaking, standing still, and breathing all at the same time. She stepped up in front of all to make the introductory remarks. Serendipitous Graces Quilt by Eileen Melia, Affirmation Quilt Ministry. Eileen included a passage she had written during the Writing Grace workshop with Alissa Lukara about how Toni personally helped her. Amen. I live in continual thanks for how much Toni has listened to me and my processing of life. Difficult experiences and difficult people necessitated and shaped her gift, but it was the intense work she did to hone the skills of a listener that taught her to so skillfully inject suggestions and motherly kindness when spirit or intuition so move her. 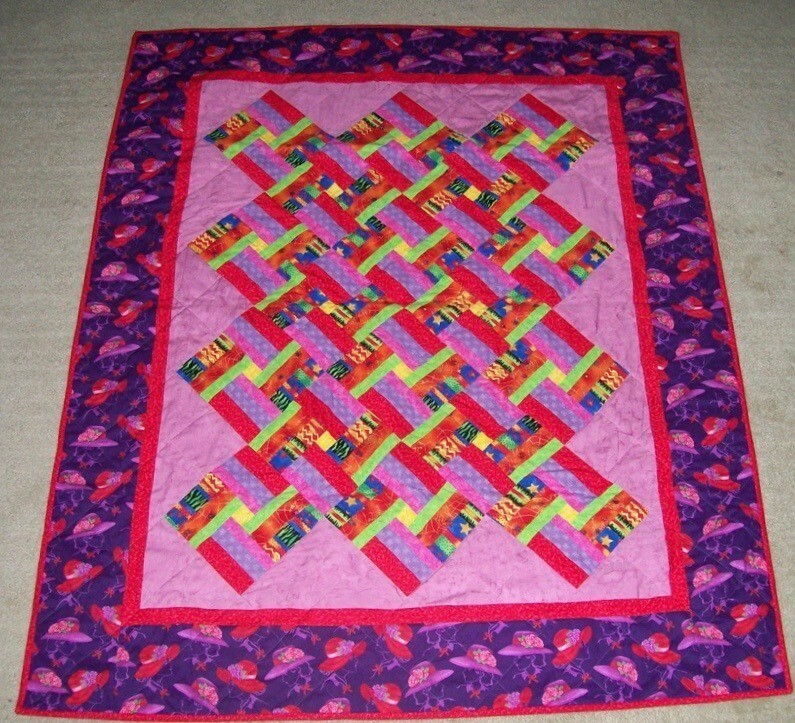 I am pleased and grateful Toni’s gifts and her quilt came before me and mine. ©Elly Brosius, 2016. All rights reserved. Excerpting is allowed with credit and direction to original content. For full reprint permission, contact@intersectingstories.com. Photos supplied by Eileen Melia and Toni Marshall.